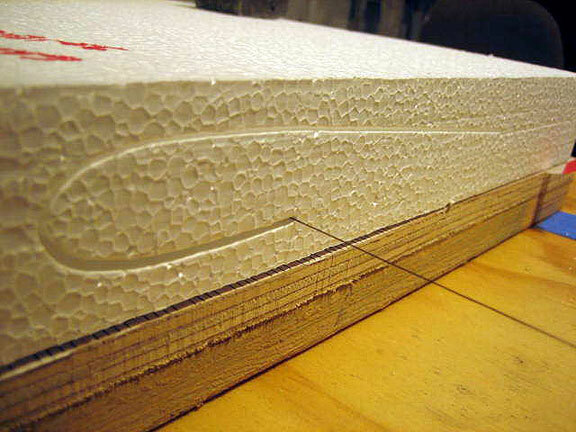 In October 2011, I began a project to cut 20 planes worth of foam for fast planes. When I fired up the software and input airfoils, the old problems returned. After a couple of weeks of redrawing and downloading new software, I got the project loaded into the cutting software. 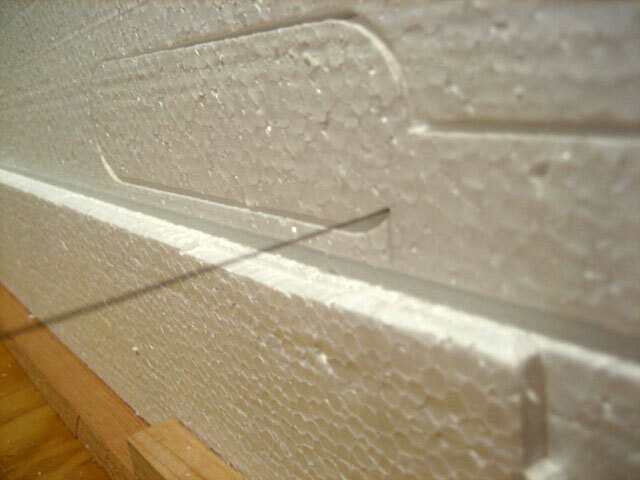 I wanted to cut rectangular blocks from 6-foot-long by 2-foot-wide foam blocks using the foam cutter. When I fired up the software and cutter, the motors energized, but the software was not picking up the timer value from the controller box -- not good. Without the timer value the system is dead. I had this problem once before and replaced the chip so I ordered a new chip. The new chip arrived but did not solve the problem. Trying to figure out what is wrong is frustrating. How likely is it that both boards are bad? Looks like there is a software issue. The software supplier says no problem, try a different computer. The hardware supplier says check the software. Never heard this before -- if they talk to each other they will both find some way to blame me. I could load the software on my home office computer, but I know it will screw with my printer drivers; I did this once before. I packaged up the chips and sent them back to the kit supplier see whether they were indeed bad or if something else was going on. After 15 days, no word, then I was told that the test equipment had been sold and there was no way to test them. The good part about this is that at least all four motors energize. It tells me nothing about how the board is performing. What is that noise coming from the computer? Oh, it is just the hard drive crapping out. OK this was a free computer, used to be the server from where I worked. I unplugged everything and hauled it to the local computer repair shop. Sixty-five dollars later, I had a new hard drive and all the old files copied over. When I fired up the software and cutter, the motors energized, but the software was still not picking up the timer value from the controller box -- not good. A few months back I had bought a color printer. 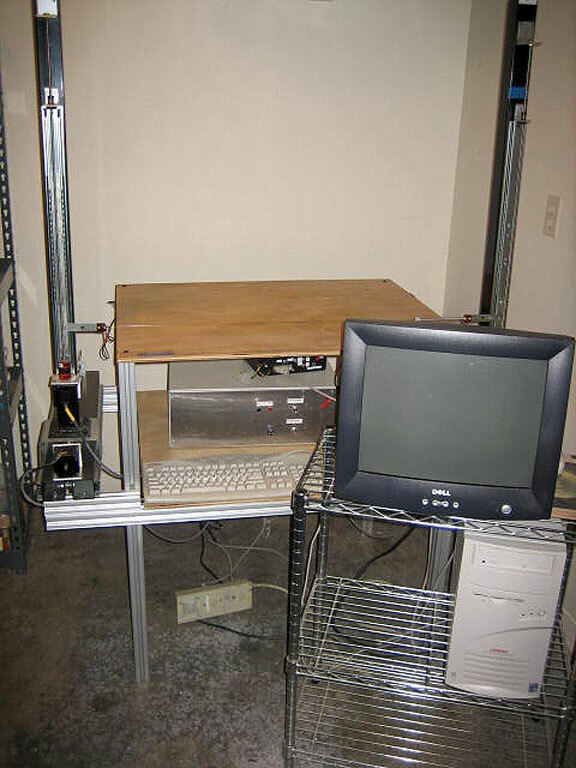 I decided it was time to hook it up and take the 15-year-old HP Desk Jet 500 to the shop. I hooked it up to the shop computer and tried to print. You ask why? Well the computer communicates with the cutter electronics through the printer port. Nothing printed. So at this point, I either have a computer that will not run the board or a board that will not run the machine. In the meantime, Robert Smith has nothing to build and wants cores. To eliminate one of the problems, I decided to get a new board. 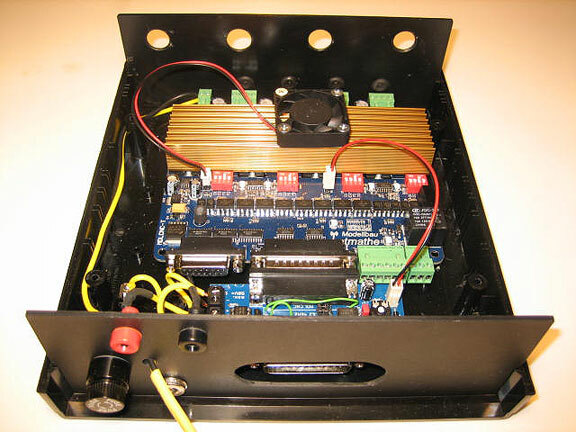 A review of the Internet showed that there was a complete board available from Germany. Well how do you order online from a site that is written in German? Simply write them an e-mail and get them to respond in English. After several e-mails, I finally ordered a new setup. It shipped on Dec 13, and it took over a month to get to me. With the new board, I ordered a power supply. Only problem was it was set up for European outlets. I contacted the supplier and he said get a cord and he would credit my account. The new board actually involved two boards. These need to be put into a housing. Allied Electronics had the housing and Shack had the rest of the materials. It took the better part of a morning to get everything fitted and soldered. At this point I have two boards that do not work -- total invested $200. New board and supporting equipment -- $300. Looking downstream to see what other cost might be involved if the new board does not work with existing software and hardware will involve a new computer. For some reason, yet to be determined, the software does not want to load completely on the shop computer. I decided to drag my office computer into the shop and see if I could get it to work. When I loaded the software it would not accept the license key. After a couple of e-mails to France, I had a key that would let me run the software. The plan is to see if the old boards are dead or if the problem is a software problem with the old computer. With all the waiting for information and materials, I decided to work on my CAD skills by drawing up the Sonic Chicken. This was as bad as building them. After about 80 hours I have two sheets of drawings for the Sonic Chicken and elevated my CAD skills. When I hooked up the office computer to the foam cutter. To my surprise, it worked. Because the old computer is not communicating with the foam cutter, it has to be either software or hardware -- duh. Just for grins I decided to pull the computer apart and look to see if there is a loose connector between the motherboard and the printer port. No loose connection. Must be software like a corrupted file. A diagnostic test and two bad files. These were corrected software reloaded, problem still not solved. What I did learn is the drivers are different in windows XP and Win 98. On XP it uses the lower XP driver to provide more flexibility, on Win 98 it uses the hardware directly. So where do I go from here? I want a new computer for the office but Microsoft is going to be coming out with Windows 8. It looks like I can get a used computer with Windows XP for $120. While I am waiting on the computer to be set up, I need to order foam. Now, I have been buying foam from this manufacturer for a long, long time. When I called them they said I needed to buy it through a distributor and, by the way, they had a $250 minimum. I asked them who my local distributor is and they said there was none. After some more discussion, they agreed to sell me the foam direct as long as I bought the $250 minimum. Well, Robert said he wanted some extra foam, boy is he in for a surprise -- 72 sheets of foam or 216 planes. Before cutting wings, blanks must be cut from the sheets. In the past I used a piece of plywood, a jig, and a hot wire. Over the years, the plywood has bowed, and cannot be used for square cuts. The GMFC software has a block cutting function. This will be a good test of the equipment before I cut the wing cores. Little did I know what a test of patience I was about to be put through. Because it is a new board, the system must be recalibrated. I began by looking at my notes. Unfortunately I did not write down all the parameters. I am cutting cores for fast planes. These are the ones Jeff Dawson flew to win the 2011 Bladder Grabber. I wanted to use the machine to cut the motor mount recess, the engine recess, bladder compartment, and the wingtip. As I was cutting foam, I lost heat to the wire. Pulled out the VOM and started testing for continuity. Everything tested good. I use a foot pedal switch to control the heat to the wire. When I picked up the switch, and shook it, it rattled. I took it apart and found that one of the screws that hold the two wires had come loose -- another problem solved. A great thing about the machine is it can be cutting a panel while I am working on something else. To date I have cut 80 panels consisting of 30 fast planes and 10 1/2-A planes. Time to figure out how to use computer heat control. Gilles's software gives a procedure for setting up to use the heat control. The first phase is to set the manual phase. I placed a piece of foam on the table, input all the values into the program, through the switch on the black box to manual, and watched the wire push the foam block -- no cutting. Pulled the block off the board, grabbed a small scrap piece of foam, and pushed the on button for the hot wire, continued to push it until the wire began to get hot enough to cut the foam. I shut the system down to see if it would remember the settings or if I would have to set them each time I began a session. It does not remember the settings. It is up to the user to record the values. One way to do this is to set up a file for each cut type. Next, I wanted to see how the auto heat control worked. I started cutting Sonic Chicken wings. These have a high sweep and thin airfoil at the tip. It is easy to get too much heat and melt the foam. To keep this from occurring, you cut a longer and then trim to shape. When you do this, you get a wingtip that is not overheated. As I was testing, the new computer decided to lock up. I shut it down and turned it back on. I was rewarded with a Blue Screen of Death then a black screen. Disconnected everything and hauled it to the repair shop. Fifty-five dollars later and I have a new used hard drive and one dead one. Since they transferred all the files and data from the old drive to the new one, I just knew that when I hooked everything backup I would have problems. Hooked it up and nothing happened. Looked behind the power supplies and saw that the power cord had become disconnected when I was moving things around. Plugged it in and all is well. In looking at the User Group, I saw a post about a program that would trick the cut process and give a better cut at the tip leading edge. Went to the site and downloaded it. The only problem it is in French. My last experience was in the 10th grade when I took, let me rephrase that, French took me. A few e-mails and a guy in the Netherlands said he would translate the files and send them to me. Ain't the Internet great? Well, it has been two years since I started writing Part IV. During that time, I have cut panels for fast, F2D, and 1/2-A planes. What used to take a week to go from drawing to a wing takes less than a day. The most time-consuming part is getting the data points off the airfoil. This is a manual process. Once the points are recorded, it is a matter of putting them into AutoCAD, creating the airfoil, and debugging. The foam supply is almost depleted. I sold Jeff Rein 16 sheets and will pick up the last of it from Robert's. The Sonic Chicken CAD drawing is not complete, but is being revised to reflect some substantial design changes. The following shows the Sonic Chicken bladder compartment being cut. The machine is working well, but I am thinking about building a new, improved version.